One size (fits heads 18-22” / 46-56 cm); circumference 18.25” / 51 cm (unstretched); height 8.5” / 22 cm (height is adjustable). 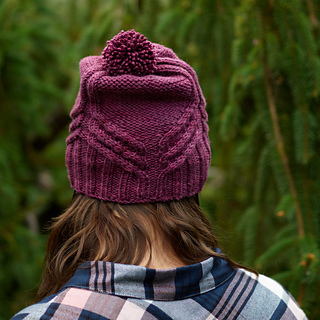 Bold, dramatic cables cascade out of 2x2 ribbing into three ribbed spines that meet at the top of this modern, fun-loving toque. 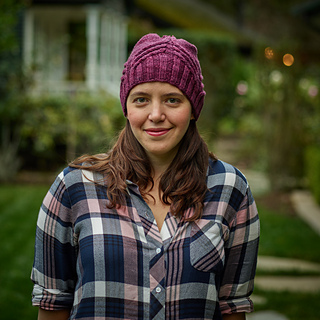 Worked in an aran-to-chunky weight yarn, this hat is a quick, engaging knit, with something for everyone: an engaging cable chart, a meditative reverse-stockinette section, and easy-to-work shaping to bring it all together at the end. 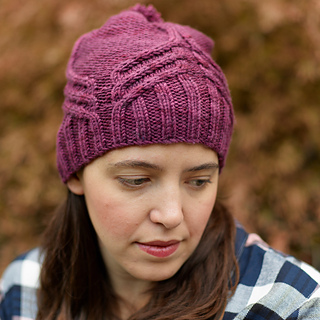 The round, bouncy structure of Miss Babs’ new Madison base gives these cables great definition and dimensionality, while the subtle variegations in Babs Ausherman’s beautiful hand-dyed colorways move beautifully through the reverse stockinette sections. 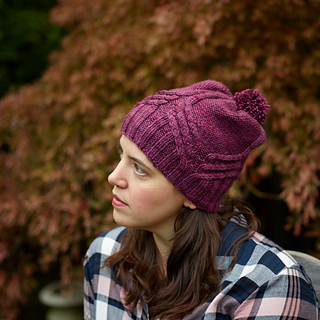 I made this version with just-enough slouch and an added pom pom, but the height is easy to modify: just shorten or lengthen the “work even” section between the cables and the crown shaping, as desired. 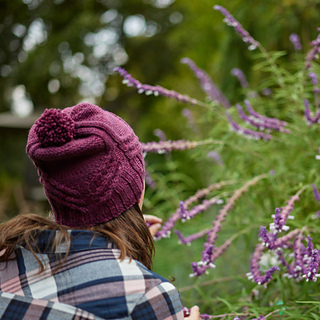 For a more fitted, unisex version, work fewer rounds between the cables and the shaping, omit the pom pom, and choose a darker, subtler colorway, or go hog wild with speckles, more slouch, and a bigger pom for the young—or young at heart!—soul in your life. One size (fits heads 18-22” / 46-56 cm); circumference 18.25” / 51 cm (unstretched); height 8.5” / 22 cm (height is adjustable). Note on sizing: the ribbing-based cables have a lot of stretch, so you’re looking for a good amount of negative ease. Miss Babs Madison (100% Superwash Merino Wool; 200 yards / 180 meters per 5.6 oz / 160 grams); 1 skein, or 200 yards / 180 meters of aran- or chunky-weight wool or wool-blend yarn. 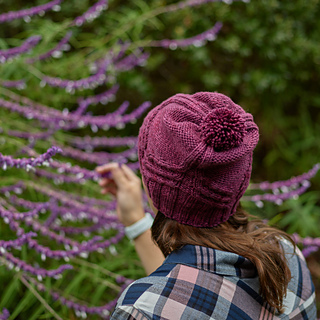 Sample knit in “Plum.” Sample uses 123 g of yarn with pom-pom. 21 sts and 28 rnds per 4” / 10 cm in cable pattern on larger needles, after blocking. One long (32” / 80 cm or longer) circular needle (for magic loop), or 5 double-pointed needles, per knitter preference, in sizes US 8 / 5.0 mm and US 6 / 4.0 mm or size needed to obtain gauge and two needle sizes smaller. Stitch markers (optional); tapestry needle; pom-pom maker (optional); cable needle (optional). Decreasing; knitting in the round; small-circumference circular knitting using double-pointed needles or magic loop; cabling with or without a cable needle.